1) What are the activities in the workflow builder? The workflow builder activities are Attributes, Messages, Process, Functions, Events. 2) How to use set or get attribute values from back end? 3) How to attach the form to the notification? Declare attribute type as form and give value is form function name and attach to message and give it to notification. 4) What is performer field? Performer field is nothing but person who receive notification. 5) What are access levels? 100–999 Customer organization. You can determine how you want this range to be interpreted. For example, 100 can represent headquarters, while 101 can represent a regional office, and so on. 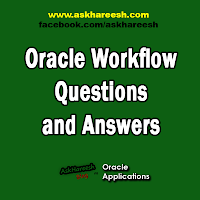 6) What are the modes we have in workflow function? RUN, CANCEL, SUSPEND, TIMEOUT, FORWARD, TRANSFOR. 7) What is look up types? Look up type is list of values( look up codes). 8) What is runnable Check box? We can’t run the process directly if runable checkbox is unchecked. 9) How to launch the workflow from backend? Launch process directly run the process. Create process will pick up the process. Create Process is used for complex process. 10) How to change performer name dynamically ? 11) What is expand roles check box? If this check box is checked then notification delivered to all users , if uncheck even one Performer open the notification it will be close for other users. 12) What are the comparison activities? Compare date, compare execution time, compare event property. 13) What is notification function? First notification will deliver to user and then function will execute. 14) What is itemkey and userkey? Both are used to track the process execution.